Crash Test Girl [Audiobook] | Free eBooks Download - EBOOKEE! Kari Byron (Author, Narrator), "Crash Test Girl: An Unlikely Experiment in Using the Scientific Method to Answer Life's Toughest Questions"
From the former host of Discovery's MythBusters and television's favorite female science geek - a guide for using the scientific method to crash test your way through life. 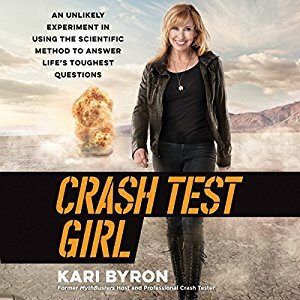 Kari Byron takes the stereotypes and stigma around being a woman on television and in science and - quite literally - blows them up. She is proof that you don't need to wear a lab coat - or, be a guy - to geek out on science. In turning her love of art, sculpture, and special effects into a career involving explosives and hard hats, she has catapulted herself into an unexpected role as the queen of scientific stunts. No comments for "Crash Test Girl [Audiobook]".